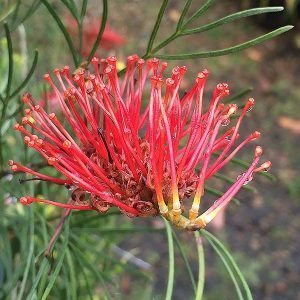 With classic toothbrush flowers, Grevillea tetragonoloba is regarded as one of the best for attracting honeyeaters to the garden. It has earned itself the common name of ‘Honey Eater Heaven’, and when it flowers, from winter through to late spring it lives up to its name. This is a small to medium growing Grevillea, reaching only around 1 – 3 metres in height. It will spread to around 3 metres over time. Like most Grevilleas, this is an easy care plant in a sunny position in a well drained soil. In areas of wet soil or poor drainage, consider hilling up the soil to improve the drainage. A little slow release native plant fertiliser (low phosphate) in spring will be all that is need in most reasonable soils. You can lightly tip prune Grevillea tetragonoloba after flowering to promote a bushy habit. Be careful not to prune back into old wood. Growth habit will vary depending on soil and climate. Soil – Humus rich and very well drained. Flowering period – Spring through to summer.